The opinion poll indicates clear interest from UK Cypriots to obtain Cypriot citizenship – 81% saying they were “highly likely to apply for Cypriot citizenship”. UK Cypriots overwhelmingly support the UK remaining in the European Union (83%) and think there should be a referendum on the final deal with the EU (83%). Federation President, Christos Karaolis, said “This is the first national, representative opinion poll of the UK Cypriot community on these crucial issues. We’ve heard our community’s voice loud and clear and this will guide our advocacy on Brexit and Cypriot citizenship. The National Federation of Cypriots in the UK has conducted a national, representative, opinion poll on two timely and important issues for the UK Cypriot community. These issues regularly feature in conversations amongst our community and people often express strong opinions on both topics. The conclusions of the ‘Cypriot citizenship & Brexit opinion poll’ can be read below, including a summary of the verbatim feedback. Commenting on the results, Federation President Christos Karaolis thanked those who had participated and said that, “UK Cypriots have had their say on two very important issues to our community. We’ll use the community’s voice to advocate to the Cypriot Government on the issue of Cypriot citizenship and build on the conversations we regularly have with them on this topic. The Brexit opinion poll results, overwhelmingly in favour of remain and a referendum on the final deal between the UK and the EU, enable us to make accurate and factually based representations to the UK Government and Opposition on behalf of the UK Cypriot community. In all of 2015, the year before Britain voted to leave the European Union, there were only 30 applications for Cypriot citizenship at the Cyprus High Commission in the UK. After the EU referendum, the number of applications has increased by 670% to ~200 in the UK Consulate between January and July 2018. 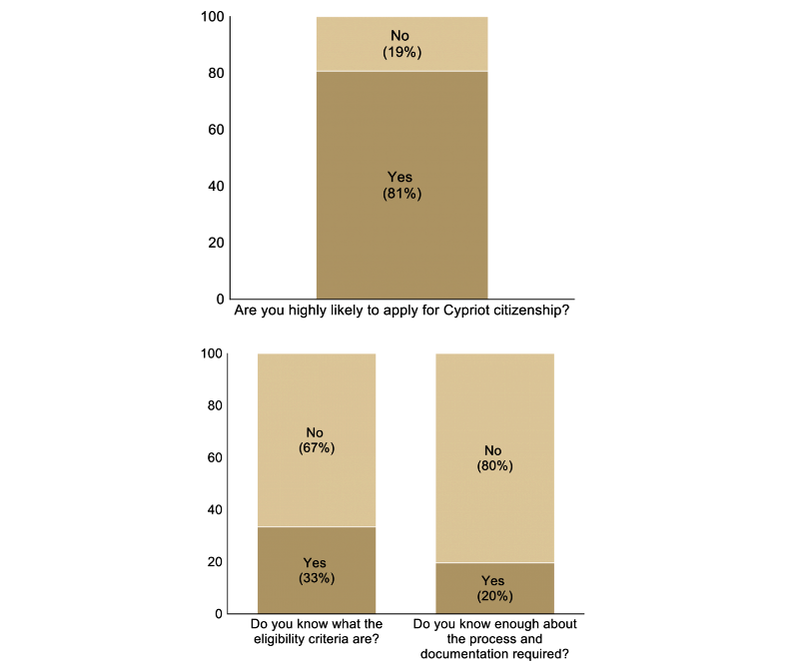 The opinion poll highlights that there are many more UK Cypriots that are interested in obtaining Cypriot citizenship – 81% responded that they were “highly likely to apply for Cypriot citizenship”. It also indicates concerns about a lack of information in the community about the process of obtaining Cypriot citizenship with two-thirds unclear about the eligibility criteria and 80% unsure about the process and documentation required. Despite the significant efforts and measures taken by the Cyprus High Commission to address the application process at the Consulate, the Interior Ministry of Cyprus could do more to streamline and expedite the criteria and process. The verbatim feedback, whilst highlighting the significant interest in applying, also revealed key themes that needed to be addressed about the “difficulty” and “confusion” surrounding the application process. The results of the Brexit opinion poll show that an overwhelming majority of the community (83%) is in favour of remaining in the EU. 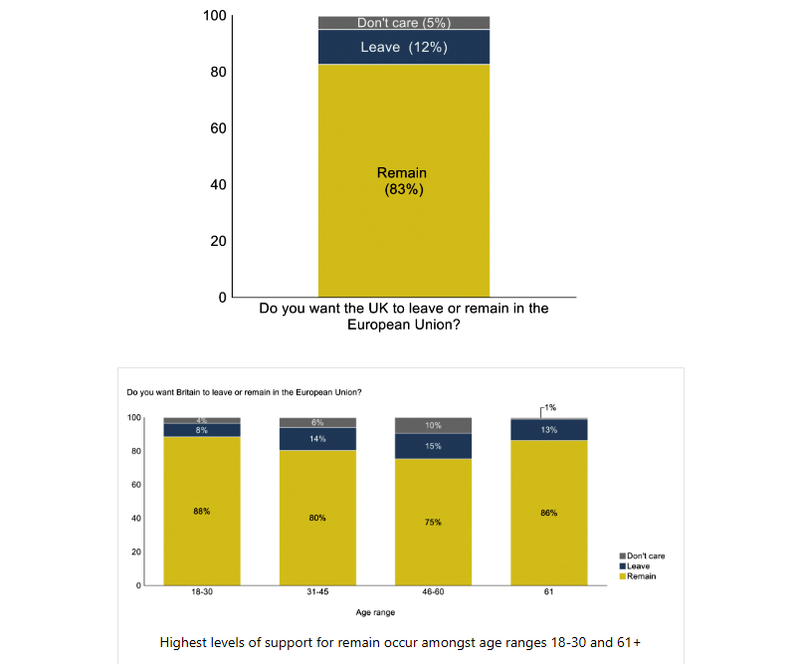 In addition, 12% of the community is in favour of the UK leaving the EU and 5% do not care. The community is just as decisive on whether there should be a referendum on the UK’s final deal with the EU – 83% of respondents said that there should be a referendum on the final deal whereas only 14% believed that there should not be. 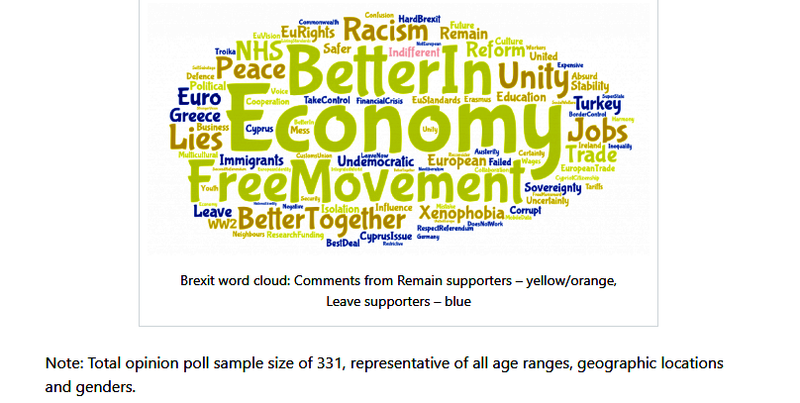 The key reasons our community gave for supporting remain are focused on the economy, free movement, fear of racism and the benefits of European collaboration. For Brexit supporters, the key reasons focused on concerns around immigration, democratic deficit and the handling of financial crises in the EU in recent years.